Ipratropium bromide is a white to off-white, crystalline substance. It is freely soluble in lower alcohols and water, existing in an ionized state in aqueous solutions, and relatively insoluble in non-polar media. ATROVENT (ipratropium bromide) Nasal Spray 0.06% is a metered-dose, manual pump spray unit which delivers 42 mcg ipratropium bromide (on an anhydrous basis) per spray (70µL) in an isotonic, aqueous solution with pH-adjusted to 4.7. It also contains benzalkonium chloride, edetate disodium, sodium chloride, sodium hydroxide, hydrochloric acid, and purified water. Each bottle contains 165 sprays. Ipratropium bromide is an anticholinergic agent that inhibits vagally-mediated reflexes by antagonizing the action of acetylcholine at the cholinergic receptor. In humans, ipratropium bromide has anti-secretory properties and, when applied locally, inhibits secretions from the serous and seromucous glands lining the nasal mucosa. Ipratropium bromide is a quaternary amine that minimally crosses the nasal and gastrointestinal membranes and the blood-brain barrier, resulting in a reduction of the systemic anticholinergic effects (e.g., neurologic, ophthalmic, cardiovascular, and gastrointestinal effects) that are seen with tertiary anticholinergic amines. Absorption: Ipratropium bromide is poorly absorbed into the systemic circulation following oral administration (2-3%). Less than 20% of an 84 mcg per nostril dose was absorbed from the nasal mucosa of normal volunteers, induced-cold adult volunteers, naturally acquired common cold pediatric patients, or perennial rhinitis adult patients. Distribution: Ipratropium bromide is minimally bound (0 to 9% in vitro ) to plasma albumin and (alpha) 1 -acid glycoprotein. Its blood/plasma concentration ratio was estimated to be about 0.89. Studies in rats have shown that ipratropium bromide does not penetrate the blood-brain barrier. Metabolism: Ipratropium bromide is partially metabolized to ester hydrolysis products, tropic acid, and tropane. These metabolites appear to be inactive based on in vitro receptor affinity studies using rat brain tissue homogenates. Elimination: After intravenous administration of 2 mg ipratropium bromide to 10 healthy volunteers, the terminal half-life of ipratropium bromide was approximately 1.6 hours. The total body clearance and renal clearance were estimated to be 2,505 and 1,019 mL/min, respectively. The amount of the total dose excreted unchanged in the urine (Ae) within 24 hours was approximately one-half of the administered dose. Pediatrics: Following administration of 84 mcg of ipratropium bromide per nostril three times a day in patients 5-18 years old (n=42) with a naturally acquired common cold, the mean amount of the total dose excreted unchanged in the urine of 7.8% was comparable to 84 mcg per nostril four times a day in an adult induced common cold population (n=22) of 7.3 to 8.1%. Plasma ipratropium concentrations were relatively low (ranging from undetectable up to 0.62 ng/mL). No correlation of the amount of the total dose excreted unchanged in the urine (Ae) with age or gender was observed in the pediatric population. Special Populations: Gender does not appear to influence the absorption or excretion of nasally administered ipratropium bromide. The pharmacokinetics of ipratropium bromide have not been studied in patients with hepatic or renal insufficiency or in the elderly. Drug-Drug Interactions: No specific pharmacokinetic studies were conducted to evaluate potential drug-drug interactions. Pharmacodynamics: In two single dose trials (n=17), doses up to 336 mcg of ipratropium bromide did not significantly affect pupillary diameter, heart rate, or systolic/diastolic blood pressure. Similarly, ATROVENT Nasal Spray 0.06% in adult patients (n=22) with induced-colds (84 mcg/nostril four times a day) and in pediatric patients (n=45) with naturally acquired common cold (84 mcg/nostril three times a day) had no significant effects on pupillary diameter, heart rate, or systolic/diastolic blood pressure. Controlled clinical trials demonstrated that intranasal fluorocarbon-propelled ipratropium bromide does not alter physiologic nasal functions (e.g., sense of smell, ciliary beat frequency, mucociliary clearance, or the air conditioning capacity of the nose). Clinical trials for ATROVENT (ipratropium bromide) Nasal Spray 0.06% were conducted in patients with rhinorrhea associated with naturally occurring common colds. In two controlled four day comparisons of ATROVENT (ipratropium bromide) Nasal Spray 0.06% (84 mcg per nostril, administered three or four times daily; n=352) with its vehicle (n=351), there was a statistically significant reduction of rhinorrhea, as measured by both nasal discharge weight and the patients' subjective assessment of severity of rhinorrhea using a visual analog scale. These significant differences were evident within one hour following dosing. There was no effect of ATROVENT (ipratropium bromide) Nasal Spray 0.06% on degree of nasal congestion or sneezing. The response to ATROVENT (ipratropium bromide) Nasal Spray 0.06% did not appear to be affected by age or gender. No controlled clinical trials directly compared the efficacy of three times daily versus four times daily treatment. One clinical trial was conducted with ATROVENT Nasal Spray 0.06%, administered four times daily for three weeks, in 218 patients with rhinorrhea associated with Seasonal Allergic Rhinitis (SAR), compared to its vehicle in 211 patients. Patients in this trial were adults and adolescents 12 years of age and above. ATROVENT (ipratropium bromide) Nasal Spray 0.06% was significantly more effective in reducing the severity and duration of rhinorrhea over the three weeks of the study, as measured by daily patient symptom scores. There was no difference between treatment groups in the effect on nasal congestion, sneezing or itching eyes. ATROVENT ® (ipratropium bromide) Nasal Spray 0.06% is indicated for the symptomatic relief of rhinorrhea associated with the common cold or seasonal allergic rhinitis for adults and children age 5 years and older. ATROVENT (ipratropium bromide) Nasal Spray 0.06% does not relieve nasal congestion or sneezing associated with the common cold or seasonal allergic rhinitis. The safety and effectiveness of the use of ATROVENT (ipratropium bromide) Nasal Spray 0.06% beyond four days in patients with the common cold or beyond three weeks in patients with seasonal allergic rhinitis has not been established. ATROVENT ® (ipratropium bromide) Nasal Spray 0.06% is contraindicated in patients with a history of hypersensitivity to atropine or its derivatives, or to any of the other ingredients. Immediate hypersensitivity reactions may occur after administration of ipratropium bromide, as demonstrated by rare cases of urticaria, angioedema, rash, bronchospasm and oropharyngeal edema. ATROVENT ® (ipratropium bromide) Nasal Spray 0.06% should be used with caution in patients with narrow-angle glaucoma, prostatic hypertrophy or bladder neck obstruction, particularly if they are receiving an anticholinergic by another route. Cases of precipitation or worsening of narrow-angle glaucoma and acute eye pain have been reported with direct eye contact of ipratropium bromide administered by oral inhalation. Patients should be advised that temporary blurring of vision, precipitation or worsening of narrow-angle glaucoma or eye pain may result if ATROVENT® (ipratropium bromide) Nasal Spray 0.06% comes into direct contact with the eyes. Patients should be instructed to avoid spraying ATROVENT (ipratropium bromide) Nasal Spray 0.06% in or around the eyes. Patients who experience eye pain, blurred vision, excessive nasal dryness or episodes of nasal bleeding should be instructed to contact their doctor. Patients should be reminded to carefully read and follow the accompanying Patient's Instructions for Use. No controlled clinical trials were conducted to investigate potential drug-drug interactions. ATROVENT (ipratropium bromide) Nasal Spray 0.06% is minimally absorbed into the systemic circulation; nonetheless, there is some potential for an additive interaction with other concomitantly administered medications with anticholinergic properties, including ATROVENT for oral inhalation. In two-year carcinogenicity studies in rats and mice, ipra-tropium bromide at oral doses up to 6 mg/kg (approximately 70 and 35 times the maximum recommended daily intranasal dose in adults, respectively, and approximately 45 and 25 times the maximum recommended daily intranasal dose in children, respectively, on a mg/m 2 basis) showed no carcinogenic activity. Results of various mutagenicity studies (Ames test, mouse dominant lethal test, mouse micronucleus test, and chromosome aberration of bone marrow in Chinese hamsters) were negative. Fertility of male or female rats was unaffected by ipratropium bromide at oral doses up to 50 mg/kg (approximately 600 times the maximum recommended daily intranasal dose in adults on a mg/m 2 basis). At an oral dose of 500 mg/kg (approximately 16,000 times the maximum recommended daily intranasal dose in adults on a mg/m 2 basis), ipratropium bromide produced a decrease in the conception rate. TERATOGENIC EFFECTS Pregnancy Category B. Oral reproduction studies were performed at doses of 10 mg/kg in mice, 1,000 mg/kg in rats and 125 mg/kg in rabbits. These doses correspond, in each species respectively, to approximately 60, 12,000, and 3,000 times the maximum recommended daily intranasal dose in adults on a mg/m 2 basis. Inhalation reproduction studies were conducted in rats and rabbits at doses of 1.5 and 1.8 mg/kg, respectively, (approximately 20 and 45 times, respectively, the maximum recommended daily intranasal dose in adults on a mg/m 2 basis). These studies demonstrated no evidence of teratogenic effects as a result of ipratropium bromide. At oral doses above 90 mg/kg in rats (approximately 1,100 times the maximum recommended daily intranasal dose in adults on a mg/m 2 basis) embryotoxicity was observed as increased resorption. This effect is not considered relevant to human use due to the large doses at which it was observed and the difference in route of administration. However, no adequate or well controlled studies have been conducted in pregnant women. Because animal reproduction studies are not always predictive of human response, ipratropium bromide should be used during pregnancy only if clearly needed. It is known that some ipratropium bromide is systemically absorbed following nasal administration; however the portion which may be excreted in human milk is unknown. 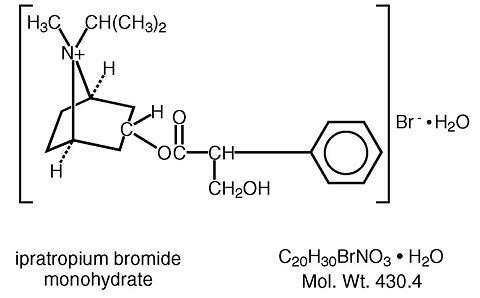 Although lipid-insoluble quaternary bases pass into breast milk, the minimal systemic absorption makes it unlikely that ipratropium bromide would reach the infant in an amount sufficient to cause a clinical effect. However, because many drugs are excreted in human milk, caution should be exercised when ATROVENT ® (ipratropium bromide) Nasal Spray 0.06% is administered to a nursing woman. The safety of ATROVENT (ipratropium bromide) Nasal Spray 0.06% at a dose of two sprays (84 mcg) per nostril three times a day (total dose 504 mcg/day) for two to four days has been demonstrated in two clinical trials involving 362 pediatric patients 5-11 years of age with naturally acquired common colds. In this pediatric population ATROVENT (ipratropium bromide) Nasal Spray 0.06% had an adverse event profile similar to that observed in adolescent and adult patients. When ATROVENT was concomitantly administered with an oral decongestant (pseudoephedrine HCl) in 122 children ages 5-12 years, and concomitantly administered with an oral decongestant/antihistamine combination (pseudoephedrine HCl/chlorpheniramine maleate) in 123 children ages 5-12 years, adverse event profiles were similar to ATROVENT alone. The safety of ATROVENT (ipratropium bromide) Nasal Spray 0.06% at a dose of two sprays (84 mcg) per nostril four times a day (total dose 672 mcg/day) for three weeks in pediatric seasonal allergic rhinitis patients down to 5 years is based upon the safety demonstrated in the pediatric common cold trials and the trial in adult and adolescent patients 12 to 75 years of age with seasonal allergic rhinitis. The effectiveness of ATROVENT (ipratropium bromide) Nasal Spray 0.06% for the treatment of rhinorrhea associated with the common cold and seasonal allegic rhinitis in this pediatric age group is based on extrapolation of the demonstrated efficacy of ATROVENT (ipratropium bromide) Nasal Spray 0.06% in adolescents and adults with the conditions and the likelihood that the disease course, pathophysiology, and the drug's effects are substantially similar to that of adults. The recommended dose for common cold for the pediatric population is based on cross-study comparisons of the efficacy of ATROVENT (ipratropium bromide) Nasal Spray 0.06% in adult and pediatric patients and on its safety profile in both adults and pediatric common cold patients. The recommended dose for seasonal allergic rhinitis for the pediatric population down to 5 years is based upon the efficacy and safety of ATROVENT (ipratropium bromide) Nasal Spray in adults and adolescents 12 years of age and above with seasonal allergic rhinitis and the safety profile of this dose in both adult and pediatric common cold patients. The safety and effectiveness of ATROVENT (ipratropium bromide) Nasal Spray 0.06% in pediatric patients under 5 years of age have not been established. Adverse reaction information on ATROVENT ® (ipratropium bromide) Nasal Spray 0.06% in patients with the common cold was derived from two multicenter, vehicle-controlled clinical trials involving 1,276 patients (195 patients on ATROVENT ® (ipratropium bromide) Nasal Spray 0.03%, 352 patients on ATROVENT (ipratropium bromide) Nasal Spray 0.06%, 189 patients on ATROVENT (ipratropium bromide) Nasal Spray 0.12%, 351 patients on vehicle and 189 patients receiving no treatment). Table 1 shows adverse events reported for patients who received ATROVENT (ipratropium bromide) Nasal Spray 0.06% at the recommended dose of 84 mcg per nostril, or vehicle, administered three or four times daily, where the incidence is 1% or greater in the ATROVENT group and higher in the ATROVENT ® group than in the vehicle group. 1 This table includes adverse events for which the incidence was 1% or greater in the ATROVENT group and higher in the ATROVENT group than in the vehicle group. 2 Epistaxis reported by 5.4% of ATROVENT patients and 1.4% of vehicle patients, blood tinged nasal mucus by 2.8% of ATROVENT patients and 0.9% of vehicle patients. ATROVENT (ipratropium bromide) Nasal Spray 0.06% was well tolerated by most patients. The most frequently reported adverse events were transient episodes of nasal dryness or epistaxis. The majority of these adverse events (96%) were mild or moderate in nature, none was considered serious, and none resulted in hospitalization. No patient required treatment for nasal dryness, and only three patients (<1%) required treatment for epistaxis, which consisted of local application of pressure or a moisturizing agent (e.g., petroleum jelly). No patient receiving ATROVENT (ipratropium bromide) Nasal Spray 0.06% was discontinued from the trial due to either nasal dryness or bleeding. Adverse events reported by less than 1% of the patients receiving ATROVENT (ipratropium bromide) Nasal Spray 0.06% during the controlled clinical trials that are potentially related to ATROVENT's local effects or systemic anticholinergic effects include: taste perversion, nasal burning, conjunctivitis, coughing, dizziness, hoarseness, palpitation, pharyngitis, tachycardia, thirst, tinnitus, and blurred vision. No controlled trial was conducted to address the relative incidence of adverse events for three times daily versus four times daily therapy. Nasal adverse events seen in the clinical trial with seasonal allergic rhinitis (SAR) patients (see Table 2) were similar to those seen in the common cold trials. Additional events were reported at a higher rate in the SAR trial due in part to the longer duration of the trial and the inclusion of upper respiratory tract infection (URI) as an adverse event. In common cold trials, URI was the disease under study and not an adverse event. 2 Epistaxis reported by 3.7% of ATROVENT patients and 2.4% of vehicle patients, blood tinged nasal mucus by 2.3% of ATROVENT patients and 1.9% of vehicle patients. Additional anticholinergic effects noted with other ATROVENT dosage forms (ATROVENT Inhalation Solution, ATROVENT Inhalation Aerosol and ATROVENT Nasal Spray 0.03%) include: precipitation or worsening of narrow-angle glaucoma, urinary retention, prostate disorders, constipation, and bowel obstruction. There were no reports of allergic-type reactions in the controlled clinical trials. Allergic-type reactions such as skin rash, angioedema of the throat, tongue, lips and face, generalized urticaria, laryngospasm and anaphylactic reactions have been reported with ATROVENT Nasal Spray 0.06% and other ipratropium bromide products. Acute overdosage by intranasal administration is unlikely since ipratropium bromide is not well absorbed systemically after intranasal or oral administration. Following administration of a 20 mg oral dose (equivalent to ingesting more than two bottles of ATROVENT ® Nasal Spray 0.06%) to 10 male volunteers, no change in heart rate or blood pressure was noted. Following a 2 mg intravenous infusion over 15 minutes to the same 10 male volunteers, plasma ipratropium concentrations of 22-45 ng/mL were observed (>100 times the concentrations observed following intranasal administration). Following intravenous infusion these 10 volunteers had a mean increase of heart rate of 50 bpm and less than 20 mm Hg change in systolic or diastolic blood pressure at the time of peak ipratropium levels. Oral median lethal doses of ipratropium bromide were greater than 1,000 mg/kg in mice (approximately 6,000 and 3,800 times the maximum recommended daily intranasal dose in adults and children, respectively, on a mg/m 2 basis), 1,700 mg/kg in rats (approximately 21,000 and 13,000 times the maximum recommended daily intranasal dose in adults and children, respectively, on a mg/m 2 basis) and 400 mg/kg in dogs (approximately 16,000 and 10,000 times the maximum recommended daily intranasal dose in adults and children, respectively, on a mg/m 2 basis). The recommended dose of ATROVENT ® (ipratropium bromide) Nasal Spray 0.06% is two sprays (84 mcg) per nostril three or four times daily (total dose 504 to 672 mcg/day) in adults and children age 12 years and older. Optimum dosage varies with response of the individual patient. The recommended dose of ATROVENT (ipratropium bromide) Nasal Spray 0.06% for children age 5-11 years is two sprays (84 mcg) per nostril three times daily (total dose of 504 mcg/day). The safety and effectiveness of the use of ATROVENT (ipratropium bromide) Nasal Spray 0.06% beyond four days in patients with the common cold have not been established. The recommended dose of ATROVENT (ipratropium bromide) Nasal Spray 0.06% is two sprays (84 mcg) per nostril four times daily (total dose 672 mcg/day) in adults and children age 5 years and older. The safety and effectiveness of the use of ATROVENT (ipratropium bromide) Nasal Spray 0.06% beyond three weeks in patients with seasonal allergic rhinitis have not been established. Initial pump priming requires seven sprays of the pump. If used regularly as recommended, no further priming is required. If not used for more than 24 hours, the pump will require two sprays, or if not used for more than seven days, the pump will require seven sprays to reprime. ATROVENT ® (ipratropium bromide) Nasal Spray 0.06% is supplied in a white high density polyethylene (HDPE) bottle fitted with a metered nasal spray pump, a green safety clip to prevent accidental discharge of the spray, and a clear plastic dust cap. It contains 16.6 g of product formulation, 165 sprays, each delivering 42 mcg of ipratropium bromide per spray (70 µL), or 10 days of therapy at the maximum recommended dose (two sprays per nostril four times a day). Store tightly closed between 59°F (15°C) and 86°F (30°C). Avoid freezing. Keep out of reach of children. Do not spray in the eyes. Patients should be reminded to read and follow the accompanying Patient's Instructions for Use, which should be dispensed with the product.